Camille Van Gestel and Maurits Groen are on a mission to bring light to people who need it. The two cofounders of Off-Grid Solutions created the WakaWaka light, a rechargeable solar lamp that can provide 8-80 hours of light, depending on the brightness settings you choose. For people who have no access to the electrical grid, the WakaWaka light is a safe, affordable alternative to using kerosene lamps, which pose fire risks and cause health problems. It’s also ideal for people who travel off the grid or choose to live an unplugged lifestyle. At home, it’s a practical solution for camping, emergency preparedness, and everyday outdoor activities. In strong sunlight, the WakaWaka light takes about 4-5 hours to fully charge. The solar LED lamp has four lighting modes—super bright torch, bright ambient light, bright reading light, and night safety light—plus an SOS beacon mode for emergencies. A cutout in the recycled plastic housing fits over the top of a bottle to create a lamp, and the WakaWaka can put out enough light for everyone around a table to read. WakaWaka is special because of its state-of-the-art solar technology—and its social mission. For every light purchased, another is subsidized in places where electric power isn’t an option. With safe, low-cost light, more families will be able to read, study, work, and socialize after the sun sets. 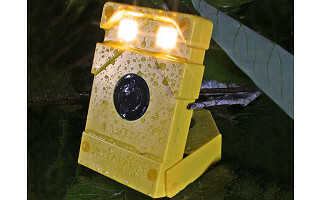 Everyone on the WakaWaka team is excited by the overwhelming response to the WakaWaka Solar Lamp. Your reviews and well wishes are greatly appreciated. For those new to the WakaWaka Solar Lamp and our mission, we set out to develop a solar lamp that could bring light to the 1.5 BILLION people living in darkness around the world. Our model is simple, use the best, patented technology, deliver a sleek well designed light that is perfect for emergency preparation (remember Hurricane Sandy? ), camping and travel, and use the profits to subsidize lights for those living on $2/day. No handouts, but a hand up in the fight to end energy poverty. Yes, it is true, an 8 hour charge delivers 16 hours of bright reading light! Disasters happen, prepare now so you will have light all night long! *Be an agent of light and double your giving this holiday season. Give a WakaWaka, give light. I checked the specs but didn't see how much the unit weighs? Is it durable enough for a kid to take to camp as a replacement for a flashlight/headlight? @ Nancy, according to the spec. it it 7ounces. @ Lou - thanks, I see it now. @ Nancy Great Question Nancy. 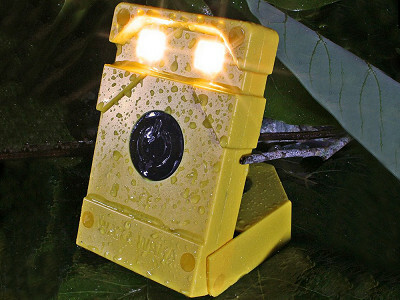 The WakaWaka Solar Lamp was designed from inception to survive the harshest environments found in Africa, India, So. America and other less than hospitable places around the world. While the unit is compact and lightweight (approx. 7 ounces shipped) making it perfect for camping applications, it is extremely durable and will provide years of excellent light. Very often kids at camp all asleep with a traditional flashlight on and kill the batteries. With the WakaWaka they will have light all night long and never have to worry about running out of batteries. Just put the light in sunlight and they are all set. Can't do it. Its made in China. Sorry. We totally understand your sentiment. We are always supportive of made in the U.S.A products, yet we know that for some companies, it's just not possible. With this product, for every light purchased, another is subsidized in places where electric power isn’t an option. We think that's a great social mission. @Lou Almost everything is made in China. But it's not the reason for not buying it or thinking it's not a good product. If you ever reside in parts of the world where this kind of product could be essential for providing light to families when it gets dark, I think you'd give it a pass on the fact it's made in China. Is it possible for me to "buy" one and have that one sent someplace where it's needed? I don't need a light like this at present, but I love this idea! That's a great question. Camille had to step out for a moment, but should be back shortly and will address that question. Seems nice & convienient, but why oh why isnt it produced in America? We need to quit the China thing and start thinking of our own people and bring down the unemployment in our country; start producing these in the good ole USA! Great concept, one I could use for dark corners, closets, but I have resolved to avoid products made in China and to support the American worker. Make it in the USA and I'll be happy to purchase one!! @ janice @Beverly @Lou, We hear you and we spend a great deal of time looking to source well-made products in the US too. But there are other values we also feel strongly about supporting, because our community is not one-dimensional. That is the beauty of Grommet...we give you the information to support what YOU care about. Some people, like a commenter today, balances the global social enterprise benefit with the source of manufacture to come up with a different conclusion about the WakaWaka. Bottom line: there's no need to alert us to the benefits of Made in USA and you can see we support those products very enthusiastically--with a whole section of our site devoted to them.. There are however sites that only focus on Made in USA....which we applaud. That is not our exclusive mission, however, so I appreciate your understanding that. We learned a lot from our friends involved in the disaster relief industry during Hurricane Sandy. It became very clear to many that even in what seemed to be a very sophisticated, urban environment like NJ/NY, millions of people could still find themselves without power for days and weeks. Since that time we have seen the positive effect the WakaWaka has had on those preparing in advance for future disasters and blackouts. We love the comments from people that continue to be amazed that their WakaWaka's stayed on throughout the long winter night and was ready to go night after night. This capability comes as a result of the patented power management system which makes the most efficient use of the solar energy captured during the daylight hours. Was going to order one until I saw "made in China". Too bad, looks like a great product. Hi! I'm brand new to this site and just noticed the feedback about the solar light being made in China. Seriously? The computers these folks were using to type their criticism was made in China. Their cell phones, too. Please get rid of this junk. I would love to see real feedback. And thank you, Daily Grommet, for offering products made in the USA. Understandably, you will also offer some items made in other parts of the world. @ L&L: Amen and right on. You may be new to this site but you seem to have a better grasp of the premise of Grommet than others posting on this item. Grommet has never claimed to be all USA goods. They try things and if they like them they share them with us. And they make it easy for folks to shop DG for only USA made items with a section dedicated to that. Heck ya I wish everything sold here was made here, but It is not realistic in today's world economy (great point about the computers and cell phones!). Now I'm off to post some real feedback, I'm wondering about the life expectancy on this gadget. . . .
just bought one! This is such a great idea, and looks like it'll get pretty bright. Perfect for emergencies. If used for emergencies most prominently - could have certainly used this when we were out of power for days twice last year - how long of a life expectancy could we expect from it? @ Emily You can expect at least 3 years until you need to change the battery the first time. After that you can expect 3 more years of care free functionality. 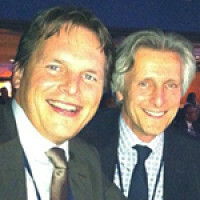 Camille Van Gestel and Maurits Groen are on a mission to bring light to people who need it. The two cofounders of Off-Grid Solutions created the WakaWaka light, a rechargeable solar lamp that can provide 8-80 hours of light, depending on the brightness settings you choose. For people who have no access to the electrical grid, the WakaWaka light is a safe, affordable alternative to using kerosene lamps, which pose fire risks and cause health problems. It’s also ideal for people who travel off the grid or choose to live an unplugged lifestyle. At home, it’s a practical solution for camping, emergency preparedness, and everyday outdoor activities. In strong sunlight, the WakaWaka light takes about 4-5 hours to fully charge. The solar LED lamp has four lighting modes—super bright torch, bright ambient light, bright reading light, and night safety light—plus an SOS beacon mode for emergencies. A cutout in the recycled plastic housing fits over the top of a bottle to create a lamp, and the WakaWaka can put out enough light for everyone around a table to read.